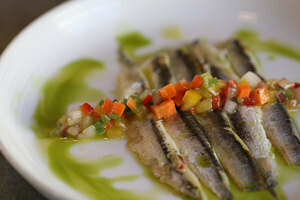 Tapas of sardines at Bravas in Healdsburg. Courtesy of Heather Irwin. Canneti Roadhouse. Courtesy of Heather Irwin. 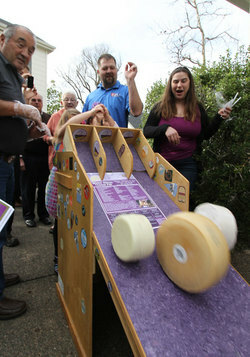 Don’t miss the cheese wheel-rolling contest at the Winter Artisan Cheese Festival in Sonoma this weekend. Courtesy of Heather Irwin. With a recent nomination from the James Beard Awards for Outstanding Restaurateur of the Year, Mark and Terri Stark of Sonoma’s Stark Reality Restaurant Group have had a busy few weeks. In addition to managing their recently opened Healdsburg restaurant ~BRAVAS~, the couple is also doing a bit of behind-the-scenes remodeling on their Santa Rosa restaurant, Willi’s Wine Bar, which reopens for dinner tomorrow after a brief closure. Starting March 5th, Willi’s will play host to some of Wine Country’s top winemakers for its uber-accessible Tasting Tuesdays from 4-5:30pm each week. For $16 you’ll get three pours of specially selected wines, a one-on-one with the winemaker, and three small bites to pair with each of the pours. The lineup includes Randall Watkins of Watkins Family Winery (March 5), Mat Gustafson of Paul Mathew Vineyards (March 12), Eric Demuth of Demuth Kemos Wines (March 19), Ulises Valdez of Valdez Family Winery (March 26), Adrian Manspeaker and Micah Wirth of Joseph Jewell Wines (April 2), Scot Covington of Trione Vineyards and Winery (April 9), Tim Hardin of Stryker Sonoma (April 16), Marcia Monahan of Matanzas Creek (April 23), and Adam and Dianna Lee of Siduri and Novy Family Wines (April 30). 4404 Old Redwood Highway, Santa Rosa, 707-526-3096. A town block party, tours of the French Laundry gardens, cooking demos, and plenty of food and wine are on the menu for Yountville’s 20th Annual ~TASTE OF YOUNTVILLE~ celebration from Thursday March 14th to Saturday March 16th. Among the restaurants participating in the Saturday block party: Bistro Jeanty, Bouchon, Bottega, étoile at Domaine Chandon, and Redd along with local wineries Cliff Lede, Goosecross Cellars, Domaine Chandon, Jessup, and many others. Admission is free, and tasting tickets are $1 each. More details online. Top artisan cheesemakers—and their fans—converge for the ~WINTER ARTISAN CHEESE FAIR~ this Sunday February 24th in Sonoma. The annual gathering centers around tastings of some of the best artisan and farmstead cheeses (with frequent undiscovered gems) from the Bay Area and beyond. There’s also a mac and cheese cook-off, along with craft brews, wine, and—dare we say it—the region’s only cheese wheel-rolling contest. MacArthur Place, 29 East MacArthur Place at Broadway, Sonoma. 1-4pm, $40 per person. 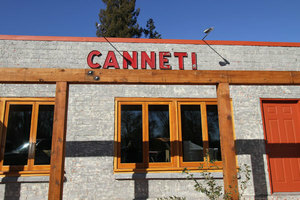 Just a quick mention that ~CANNETI ROADHOUSE~ in Forestville is slated to open next week. Chef Francesco Torre (formerly of Fish in Sausalito) has been transforming the cozy West County restaurant for nearly six months, rehabbing the kitchen, sandblasting walls, repainting, and adding tons of charm with rustic tables and chairs, rebar barstools, and a primo pasta-making machine from Italy. The menu’s still under wraps, but Torres promises some solid Tuscan-inspired eats. 6675 Front Street, Forestville.